An ancient comet that has been moving through the solar system since discovery last year reached perihelion Thursday and observers are speculating that the sun’s heat is breaking it up. Comet ISON arrived at the point in its orbit closest to the sun at 18:25 UT Thursday (11:25 am MST). At perihelion the comet is about 730,000 miles from our star. It has brightened considerably as it approached the sun, reaching a magnitude similar to the full moon. Emily Lakdawalla and Bruce Betts of the Planetary Society are blogging about the event here. You can see images obtained by NASA’s Solar Dynamics Observatory here. Intrepid early risers have the chance for a spectacular sky reward this weekend: seeing comet ISON. After a journey that has lasted at least one million years, Comet C-2012 S1 ISON will reach perihelion on Nov. 28. That means now is a good time to see the fireball. Before dawn on Sunday, Nov. 25, the comet will be visible low on the southeastern horizon. ISON originated in the Oort cloud, far beyond Neptune’s orbit. If the comet survives its trip around the sun, Earth dwellers may be able to see it again in early December. But that is not certain, because ISON will be only about three-quarters of a million miles above the sun’s surface when it is as close to our star as it will get. Comets are tiny, generally no more than about 10 kilometers across, and they are constructed mostly of ice and dust. That means the sun’s heat can easily destroy them. ISON’s nucleus is only about 6.5 kilometers across. It has a tail that extends at least 90,000 kilometers behind it. 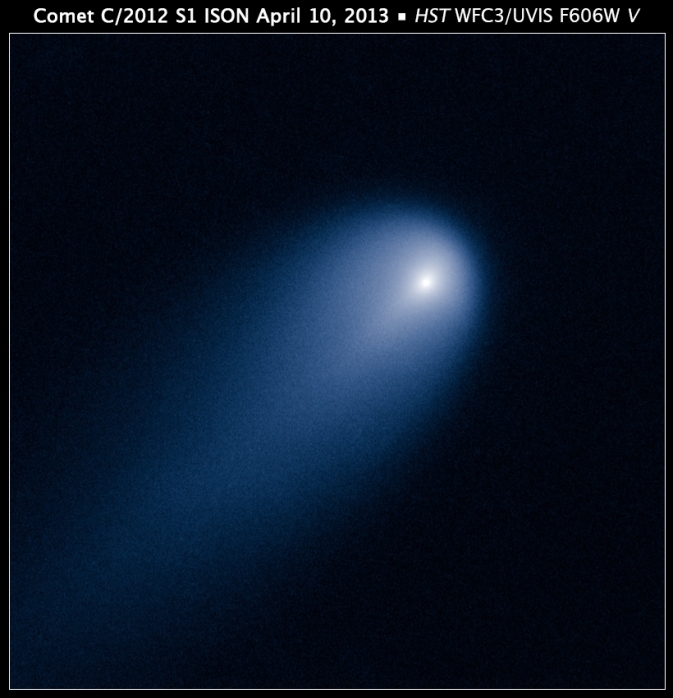 Observers first noticed comet ISON last November, when it was more than 500 million miles away from the sun. It has never before completed an orbit around the sun, which means that the comet contains material dating to the formation of the solar system. NASA has put together a helpful timeline of ISON’s journey through the solar system. Check it out!